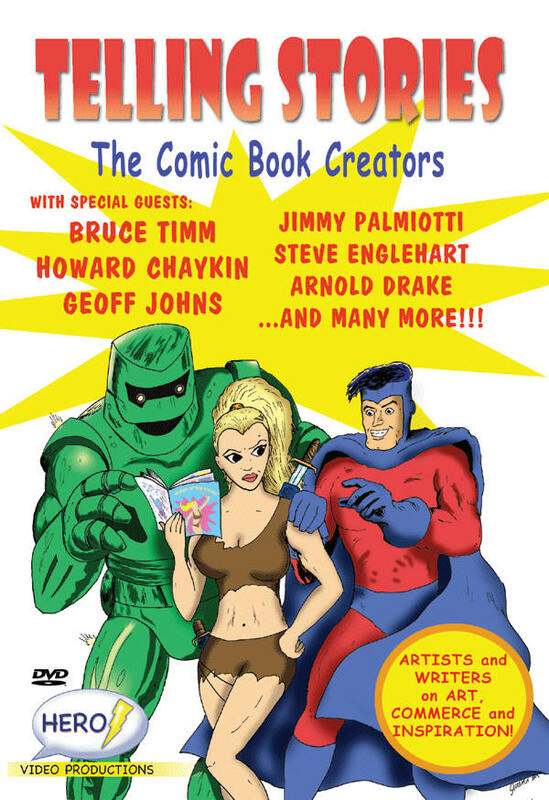 Hero Video Productions presents a 2-hour DVD packed with interviews with some of the greatest names in comics! Bruce Timm, Greg Rucka, Jimmy Palmiotti, Howard Chaykin, Geoff Johns, Steve Englehart, Trina Robbins, Adam Hughes, and Arnold Drake discuss their work in intimate interviews that reveal the craft and inspiration behind their greatest work. These superstars talk in-depth about their experiences in the industry and how they approach their art. The answers are humorous, insightful, reflective, and instructive, and anyone interested in the creative life will find inspiration in this video. As a special bonus, viewers get to visit Englehart in his studio as he scripts the long-awaited follow-up to his classic run on "Batman". This exciting DVD is from the team behind the highly acclaimed "Terry Moore: Paradise Found" DVD. A must have for any comic fan's shelf! "Want to hear the inside scoop on the industry from the creators themselves? Well, this is the DVD for you. Steve Englehart, Geoff Johns, Bruce Timm, Trina Robbins, Adam Hughes, Arnold Drake and Howard Chaykin chat it up about their careers, the characters they've worked on, and the future of comics. (Available Now)"
"This DVD from Hero Video Productions provides a great number of interesting thoughts..."
"Hero Video has organized this disc into eight chapters divided by topic, meaning a viewer can easily view them in any order or across multiple viewing sessions." "With nine creators involved, Hero Video is to be thanked immensely for identifying the interview subjects throughout the entire disc, easily solving a problem that plagues many documentary films that interview many unfamiliar subjects." "The greatest strength of Telling Stories is its information. All the people interviewed are well-versed in comic book history and eager to discuss their craft. Jurls and editor Damon Crump try to shape a natural arc out of the subjects broached, linking together why people got into the industry, what has inspired them to keep going, relationships with the audience, and the challenges inherent in working on established properties versus one's own, etc., and ending Telling Stories with chapters where the creators contemplate their legacy and the future of the art form. A lot of good stories rise up in the mix." "If you have a passing interest in comics or are a fan of any of the creative folks involved, there is a lot being talked about in Telling Stories: The Comic Book Creators that you may not have heard before. Plus, all of the writers and artists taking part are passionate about what they do, and so when they talk, it's hard not to listen." "I liked the informative content of Telling Stories: The Comic Book Creators." "If you like comic books or any of these creators strike your fancy, give Telling Stories a spin." "If you don't have time to hit the conventions and talk with the creators, then pick up Hero Video Productions - Telling Stories - The Comic Book Creators DVD, you will feel like you are right there interviewing them!" "A real tell-all and a great eye-opener!"